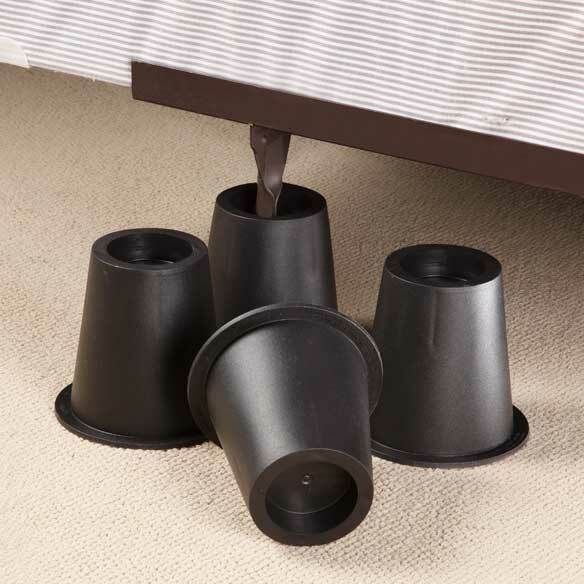 Black bed risers elevate your bed frame to make it easier to get in and out of bed. Use just two bed risers at the head of your bed to aid in breathing and digestion. Also raise it so you can slide boxes or extra bedding underneath. Durable polyethylene. Set of 4 or individually, in 2 sizes: 5" high or 3" high, each has 2 1/2" inner rim dia. Supports up to 1400 lbs. (350 lbs. per riser). I have a VERY tall husband and these really helped to make getting in and out of bed easier for him with his knee problems. Great product. Would buy again, & again. Raised my bed so the trundle will come out without hurting my back with pulling. Saved wear and tear on the sheets by giving more room. Would like a sudued color, not just black. I increased under-bed storage by using the bed risers. Makes it easier to get into bed as it is higher. my mom is 83 and has trouble rising from a low bed or chair. The 3" risers are the perfect height for her. They are difficult to find ( 6" is common) so I was happy to find them in your catalog! Dr. suggested bed be elevated. Works well! Chair Risers Make SUCH a DIFFERENCE!! Easy, economic and low tech - this solution makes life easier for persons with knee, hip or back pain who have difficulty rising from a chair. The added height makes independent movement so much easier! they are very easy to used and clean. My bedspread hinds the bed riser very much. I would recommend this product to any one that wants to raise there bed up off the floor, either the 5' or the 3' rasier. Pleased because unable to find size needed locally. We are using these bed risers to raise up the back legs on metal patio chairs. These chairs are comfortable because of the large springs that give them a little bounce and flexibility. Unfortunately, the springs were "sprung" so that anyone sitting in the chairs risked falling over backward because the springs had too much "give". Now, thanks to the risers, they're perfect. We put the risers at the head of the bed; therefore, elevating the head. It is good for my husband who has acid reflux. It has made a difference in a more comfortable night's sleep. good product. i used to hate changing sheets on my bed cause it hurt my back so much to bend over. these are a God send. thank-you Walter Drake. It does what it is designed for. I am very happy with the bed risers. I use the bed risers to have the foot of my bed up because I need that for my legs. It works wonderful. I am grateful that I got them. The risers provided more room under our bed for storage. They seem to be very sturdy. shipping was slower than many other Internet sites. The price was very affordable and the item is useful. so granddaughter can put her shoes under to bed. the risers are sturdy and strong. Raised my bed perfectly for extra storage space. My daughter wanted them as she has no wheels on her bed frame and also for easy moving of her bed and for easier to store items under her bed. Used to increase the height of a wing back chair used by a 97 year old. Assists the elderly person to more easily get out of the chair. If you can cut circles out of plywood or the like, and place into the circled riser, it will distribute the weight much more evenly and will not break through. Been there, done that, and it works! Could not find this size at any store and they are perfect. Really liked these bed risers!! the bed for better digestion per doctor's orders. I will probably order the 5 inch risers and try them. These risers work great to raise the legs up on the sofa for a painful knee condition. It is much easier to get up from a sitting position now. This product is easy to use, although a little tricky for just one person to install. But raised the bed for storage underneath and the new heighth is better for making up the bed. A lot less bending. Our home burned down a few months back, and the pack-out company did not return the brass bottoms of the legs. A bed & bath store's are 7" tall, but so far, it's lasted a good long time. I wish I could find these is a shorter more durable product. We had the product for about a month and the end ofthe be collapsed when my husband set on the bed. We have a queen size bed and all legs were supported. The set was a little smaller than the individual risers and I would recommend only getting the individual risers and not the set. After removing the one I found a crack in another riser which was on the opposite corner. The bed risers broke on the first day. sitting on bed ONCE after putting them under each foot, one completely disintegrated.Good idea cheaply made. Ordered these to access storage under low bed. The risers caused the bed to be very wobbly and with just a gentle push the risers tipped. We sent them back. We used the bed risers on an ordinary couch so we could rise from it easily. We are in our late 70's. Once they were in place, my husband and a grandchild sat down and the risers broke apart. WE HAVE RETURNED THEM BUT HAVE NOT RECEIVED A REFUND SO FAR. Feel if they didn't hold a couch they certainly would not hold a bed with two adults in it. I baught a set of the 3in. risers for my Mom for Christmas because she's really been wanting to raise her bed up higher so it's easier to get in and out of bed, pluse she wanted more storage space under the bed. We put the risers on and when my mom,who is a small women, tried to crawl into bed one of the risers broke in half and another began to crack. this jared my Mom's back and scared her. They aren't very sturdy my bed fell thru and they broke once the boys just sat on the bed. I ordered a set of 3 inch bed risers. I received 4 inch. I had to return them at MY expense. I also was charged a postage & handling when they were delivered. The only refund I received was for the bed risers. I ended up paying double to buy nothing. I will not buy from Walter Drake again! WE HAVE AN OLD HOUSE WITH VERY SLANTED FLOORS. I PURCHASE THE 3" RISERS TO PUT AT ONE END OF THE BED TO HELP KEEP THE BED LEVEL. MY TEENAGE SON SAT ON HIS BED TO PUT HIS SHOES ON AND ONE BROKE. SO I GAVE HIM ANOTHER ONE TO PUT IN IT'S PLACE AND THE NEXT TIME HE SAT ON HIS BED THE OTHER SIDE BROKE. WE ARE DOWN TO 2 LEFT AND SO FAR THEY ARE HOLDING UP. I AM DISAPPOINTED THAT THEY WEREN'T STRONGER MADE. Not built for Texas sized people at all. This product was created & marketed to raise the bed up 5 inches. The 2nd night in use two of the risers broke in the middle causing the bed to fall on that side, and patient roll off. 3 of the 4 used cracked in the middle and are useless. They are made of too light material to perform this function! New Patio furniture needed to be raised for better comfort. It looked very durable for the price. To raise up a dog grooming table for a taller-than-average dog groomer! Raise bed higher. Used them before. They work! To raise bed upon doctor's suggestion for relief of indigestion problems. Just had hip surgery and the 6" risers are to high, and makes it hard to get in and out of bed. I need my head raised at night. I want to lift my sofa up higher to enable my husband to get up without strain. Hopefully these risers work on sofas as well as beds. Bed is extremely low and I need these risers for comfort and appearance. I chose this item to raise my bed and to provide some underbed storage space. Risers are firm and solid. They fit most bed legs. Excellent product! EASE IN SITTING AND ARISING FROM LOW SITTING LOVE SEAT. BEST ANSWER: Yes. I was able to place the risers on my bed with the rollers still attached. I would have to say it probably should take into consideration how big the rollers are. Mine were on an oversize queen size mattress. 1) how much is it indented and does this measuerment subtract from the 3" or 5" height? 2) what is the diameter of the base counting lip on the 3' and 5' riser.? 3) is the lip on the top and bottom a 1/2 "? BEST ANSWER: Thank you for your question. The 3" bed risers are 4" high with a 1" indent inside. The 5" is 6" tall with a 1" indent. The base dia is 6 1/2". We hope this information will be of help to you. What is the inside circumference of the "cup" that furniture leg rests in? BEST ANSWER: Thank you for your question. The inner rim is 2 1/2" in diameters. We hope this information will be of help to you.